Medellin, the city of eternal spring, is the capital of the Antioquia province in Colombia. With a population well over 2 million people, Medellin is famed for its pleasant spring temperatures and the beautiful, annual Flower Festival. The city’s popular tourist attractions include the gorgeous views of the renowned Aburrá Valley and the Museum of Antioquia. Cheap flights to Medellin are now available for a limited period of time, so prepare for the incredible experiences this city has to offer! Medellin is served by the José María Córdova International Airport (MDE), which is a 45-minute drive from the city. Dance, drink, eat and celebrate with the locals at the renowned magical Festival of the Flowers; this vital part of Medellin’s culture includes a pageant, a horse parade and music concerts. 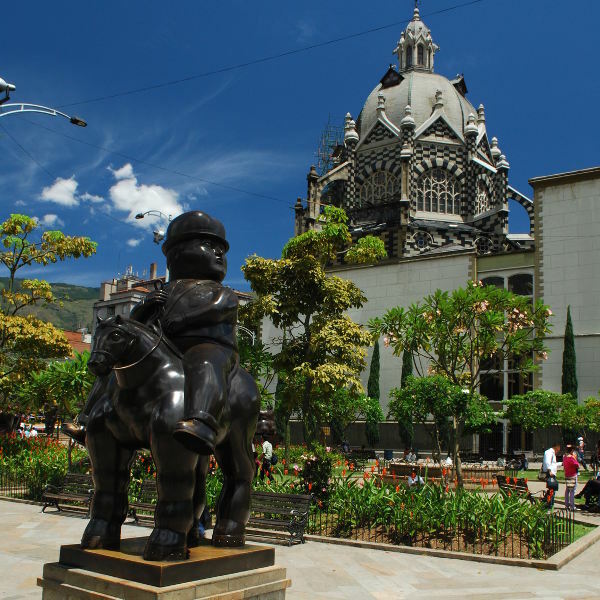 Medellin offers an incredibly vast and interesting art scene and a unique history to discover; stroll through Botero Plaza showcasing 23 sculptures by Colombian artist, Fernando Botero, or visit the Museum of Antioquia. 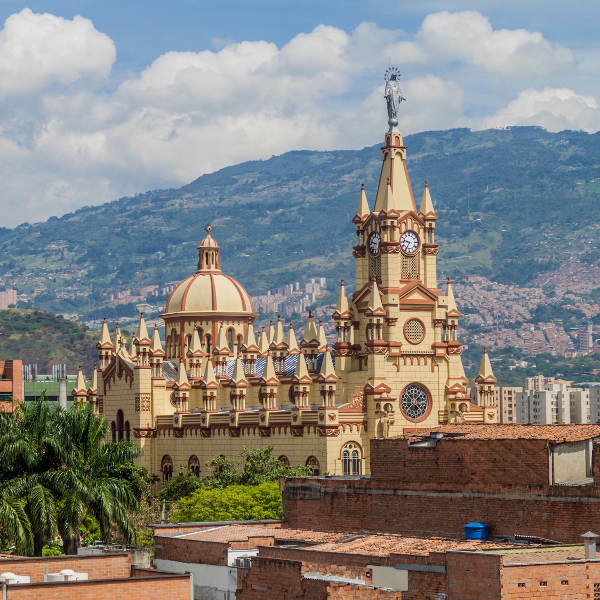 From the narrow yet beautiful cobblestone streets in Medellin to majestic skyline beauties like the Gothic-styled Jesus of Nazareth Church, Medellin is home to a vast collection of beautiful architecture to explore. December to March is the peak tourist season in Columbia. High temperatures and beautiful sunny days are awesome for going into town and exploring the colourful streets or an excursion through the Aburrá Valley, part of the Antioquia mountain terrain. This time of the year, traditional bull fights take place in January and February at the Macarena Arena and the “Medellin is a bargain” sale takes place in February. More than 1000 shopping centres and outlets mark down clothing, furniture, household items, jewellery and many more items you can take home with you. 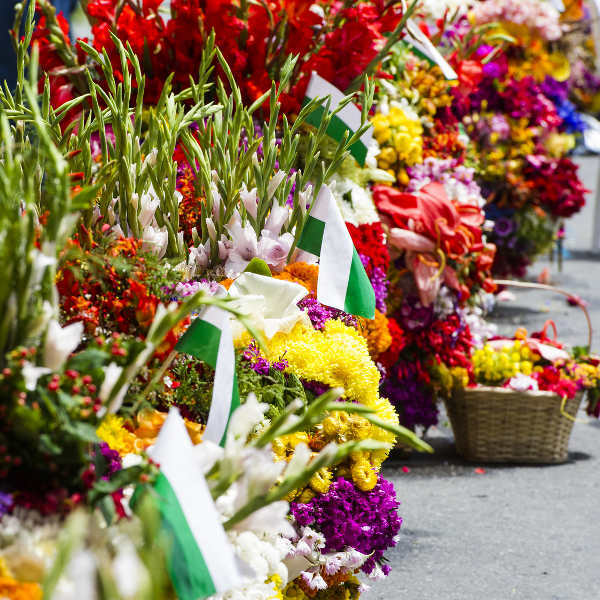 August is a great month to visit Medellin as the beautiful and famous Flowers Festival takes place. The months between September and November are low season in Medellin and Columbia as a whole. This means less crowds in the streets and better accommodation deals and air fares. The city of eternal spring, Medellin, is the capital of the Antioquia province in Colombia. It is famed for its pleasant spring temperatures and the beautiful, annual Flower Festival. Experience the most vital cultural and social event in the city, celebrate with the locals, check out the pageant and horse parade or enjoy the local sounds at the various music concerts. If you are looking to commune with nature, the gorgeous views of the renowned Aburrá Valley can be admired on a cable car ride. Be sure to visit the first museum to be established in the Antioquia province, the Museum of Antioquia. The museum houses a large collection of works by natives Fernando Botero and Pedro Nel Gómez and forms part of the Botero Plaza where 23 of Botero’s sculptures are located for your visual pleasure. Medellin has a lively nightlife and also hosts a large variety of restaurants most popularly in the ‘Zona Rosa’ area. Enjoy the delightful flavours of fresh fruit or tasty traditional empanadas, or be adventurous and enjoy a drink of the local Colombian Aguardiente. Compare several airlines, and book your cheap flights to Medellin online at Travelstart! Make sure your routine vaccines that include the MMR vaccine, DPT, Chickenpox, Polio and yearly flu shots are updated before travel. A Yellow Fever vaccination and medication to prevent Malaria is recommended. Visitors to Medellin must obtain a yellow fever certificate to be allowed back into South Africa. The Zika virus is a risk in Medellin and it is recommended that you protect yourself from mosquito bites with mosquito nets, repellents etc. Sexual transmission of Zika is possible and infection in pregnant women can cause serious birth defects, it is therefore recommended that you do not travel to Medellin if pregnant. Colombia has turned its reputation for military conflicts and drug wars completely around and is now considered a safe tourist destination. However, you should still practice normal safety precautions such as keeping your valuables and important documentation safe and watching out for petty crimes like bag-snatching or pick-pocketing. Avoid travelling alone, especially at night, and avoid taking drugs or going out with complete strangers.